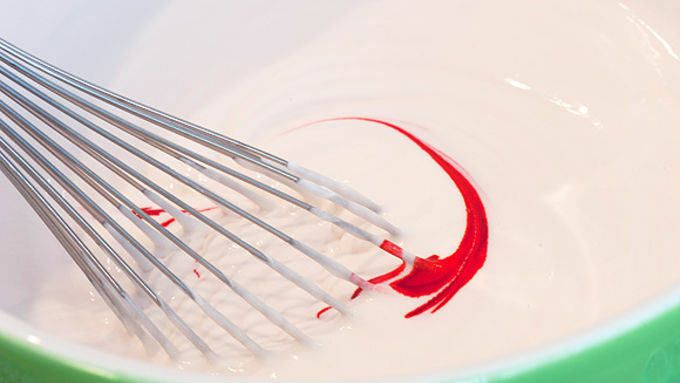 Pour the pudding mix into a large bowl. Add milk and stir for two minutes. Add the yogurt and whipped topping and stir to combine. 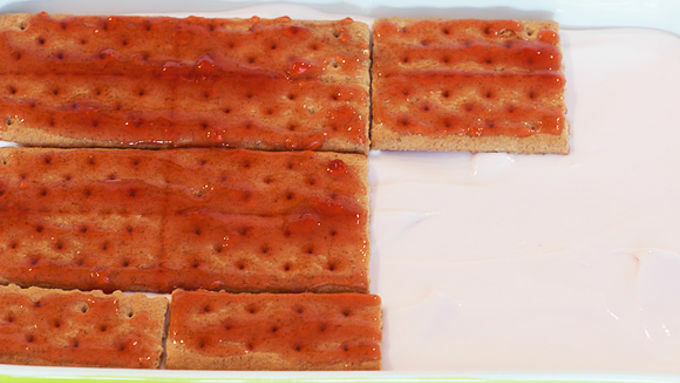 Spread graham crackers with strawberry jam, and arrange in a single layer in your pan or baking dish. 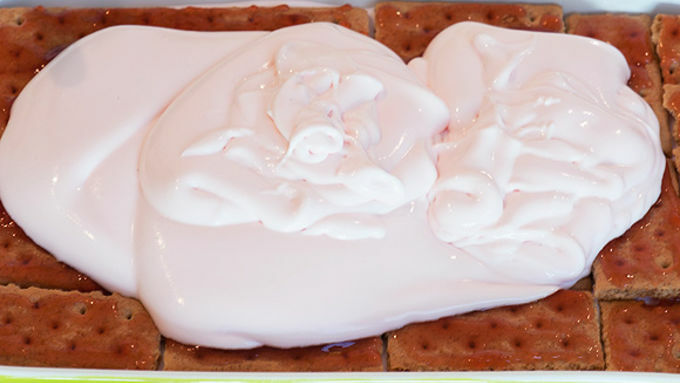 Pour 2 cups of the strawberry filling over the crackers, and gently spread into an even layer. Repeat process with layers of graham crackers, jam and filling. 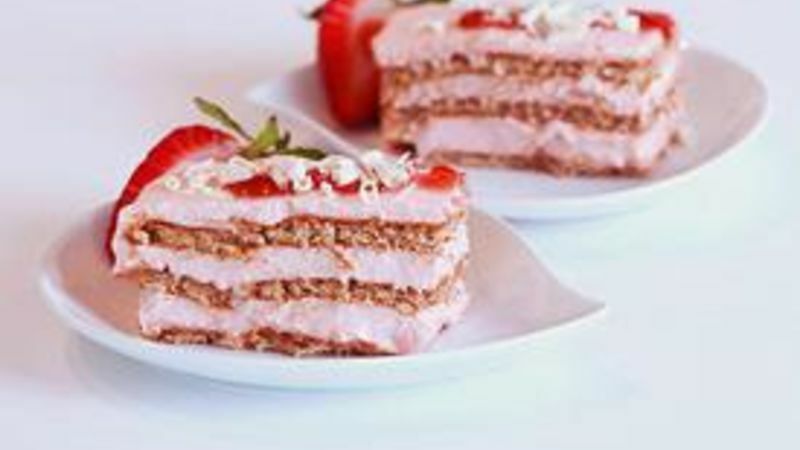 You should have three layers of each, with a layer of the strawberry filling on top. Refrigerate for 8 hours, or overnight. To serve, slice and garnish as desired. Ice. Box. Cake. I’ve expressed my love for this old school dessert, so I won’t bore you with an elaborate retelling of the virtues of easy cake or its alchemic charm. 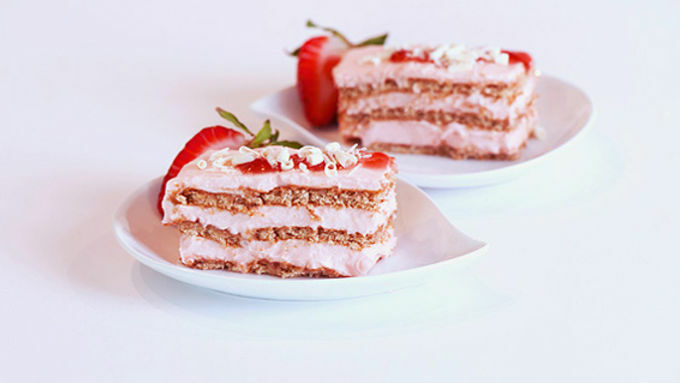 For this Strawberry Ice Box Cake recipe (perfect for Valentine’s Day…hint, hint! ), I wanted to dial back the caloric wickedness factor and keep things a bit lighter without losing the “yum” factor. 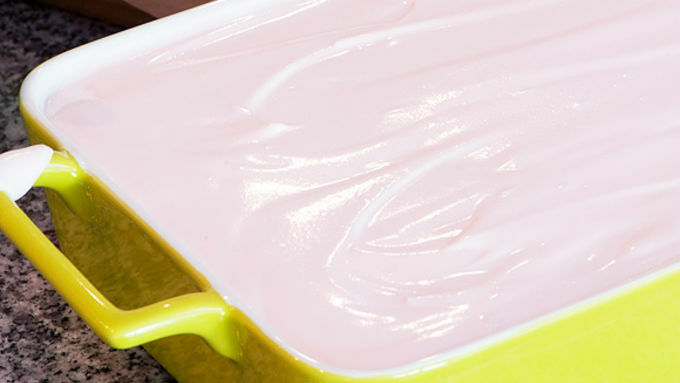 Strawberry yogurt was a great sub for some of the whipped topping in the classic recipe – it’s just as sweet and creamy with the tiniest little tang – and wonderful with the instant pudding. The nice thing about this recipe is that it’s easy to dial it back a bit more - use a light yogurt, light whipped topping and and/or use a sugar free pudding and prepare with skim milk. Try a sugar-free strawberry jam. (However, I see no reason to skimp on the white chocolate curls. That would be taking things way too far!) Pop the pan into the refrigerator and... Just. Walk. Away. Go shopping, to the gym or to the movies. Laundry? Write a novel? Wash the car? Nap, anyone? Do whatever you like. The Ice Box Cake is hanging out in the fridge, doing all the work for you! To serve, slice into rectangles and top with a half strawberry, white chocolate curls, and maybe a smudge of the strawberry jam, if you’re feeling fancy. Or, scoop it and serve with additional whip and a strawberry!